) own a smartphone. In this constantly connected world, people use mobile search throughout the day to find information, shop, and stay connected. Businesses, therefore, are making mobile a central part of their business and marketing strategy: from building better websites across screens to optimizing mobile ads. When speaking with advertisers we often hear questions like “What would happen to my organic clicks if my mobile search ads were paused?” They want to know how much of a role their ads play in driving people to their website. In 2011, we ran the “Search Ads Pause Studies,” and learned that an average of 89% of clicks on search ads are incremental - meaning that this traffic is not replaced by organic clicks when ads are paused, and therefore is missed. This year, we carried out the same studies on mobile search and learned that 88% of site visitors driven by mobile search ads would not otherwise click on the business’s organic listing when ads are paused. From March 2012 - April 2013, we conducted Mobile Search Ads Pause studies on more than 300 US AdWords accounts from 12 key verticals. The research focused on search terms that had an organic listing on the first page and adjusted for factors like seasonality. 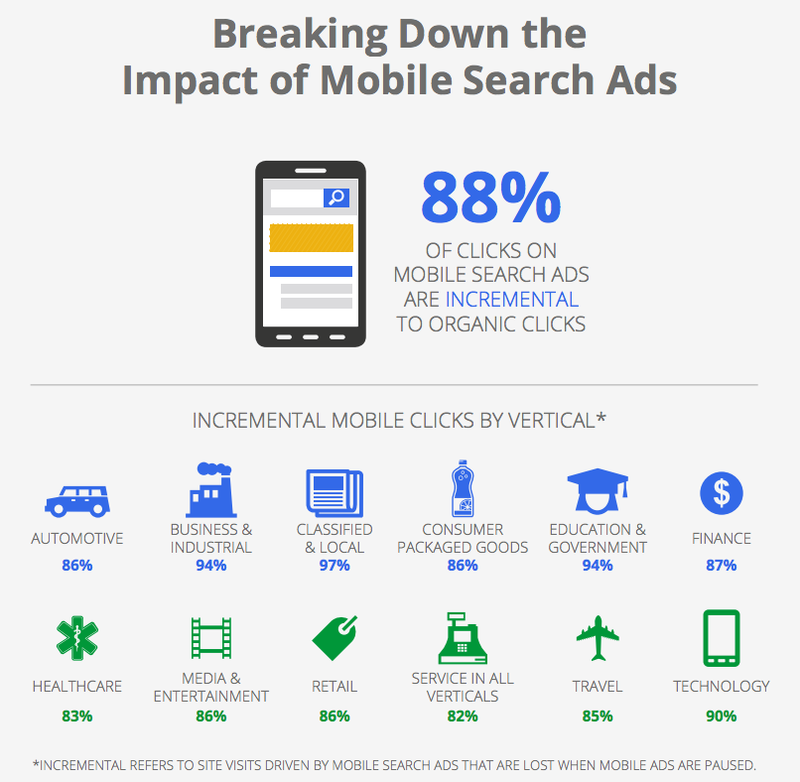 Similar to our previous study of search ads across all devices, we found that an average of 88% of clicks generated by mobile ads were incremental. Results were consistently high across all verticals: 97% of mobile ads clicks are incremental for classified and local advertisers, 86% for retail advertisers, and 90% for technology brands, just to name a few. Today consumers use mobile search to connect with businesses across a wide variety of industries and trust both organic and paid results to help accomplish their goals. The infographic below shows the percentages across all 12 verticals. Mobile ads can help consumers connect with all types of businesses. This study continues to show the importance of advertising on mobile whether you are a restaurant owner, a sporting goods retailer or automobile brand. People are searching all the time, across devices. Therefore, it’s more important than ever before to make sure that your message is where people are looking. AdWords enhanced campaigns makes this easy for advertisers. By upgrading to enhanced campaigns, advertisers can effectively reach consumers using mobile devices based on contextual signals like their location and time of day. This year, for the first time, the majority of people in the US (56%1) own a smartphone. In this constantly connected world, people use mobile search throughout the day to find information, shop, and stay connected. Businesses, therefore, are making mobile a central part of their business and marketing strategy: from building better websites across screens to optimizing mobile ads. When speaking with advertisers we often hear questions like “What would happen to my organic clicks if my mobile search ads were paused?” They want to know how much of a role their ads play in driving people to their website.